Bring the grand elegance of the Loire Valley into your home with this antique, Gothic iron fountain. Crafted in France, circa 1840, the water fountain features a majestic lion head sculpture, which spits water through a patinated bronze spout and into a rounded, demilune basin. The outdoor garden or patio piece is in excellent condition with a rich old painted finish throughout. 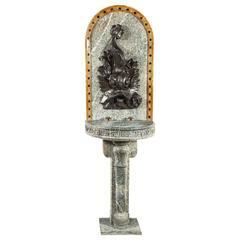 Measures: 26" W x 16" D x 47" H.
Beautiful lead fountain head. Very strong expression England, circa 1880-1900 Weathered but good condition. A very beautiful water fountain in Gothic style to place in the garden. Lion head cast stone fountain back. Nice age and patina. It is 21.75" wide x 24" high and is 7" deep from the back to the nose of the lion. Timeless lion head iron fountain garden spout. Decorative accent lion head sculpture. Nice patina.